I had been putting in countless hours at my workstation editing commercials, movies (“That They Might Fly Again”) and websites all week. I had to get out of the office. My plan was to try out the new Ram mount I had bought for my GPS. So, after putting in some morning hours, in the early afternoon of Saturday the 22nd of January I headed out to Selby Aerodrome with my tools. The temperature was in the low 40’s so it was tolerable in the hangar to work for a while. Outside the wind was blowing about 20 mph out of the south. After I installed the mount I thought it might be nice to start up the engine and let it run for a little bit. I have this idea that it is good to let a motor run on a regular basis to keep rust from forming in the case and to help prevent the plastic tubing from drying out. That’s the rationale but mostly I just like to listen to engine and prop after it settles into a nice idle. I opened the bi-fold doors, rolled my MXL to the doorway, pointed the plane so the prop blast would go outside and started it up. After it settled down and got into that familiar hum I like to hear I got a hankerin’ for some air. 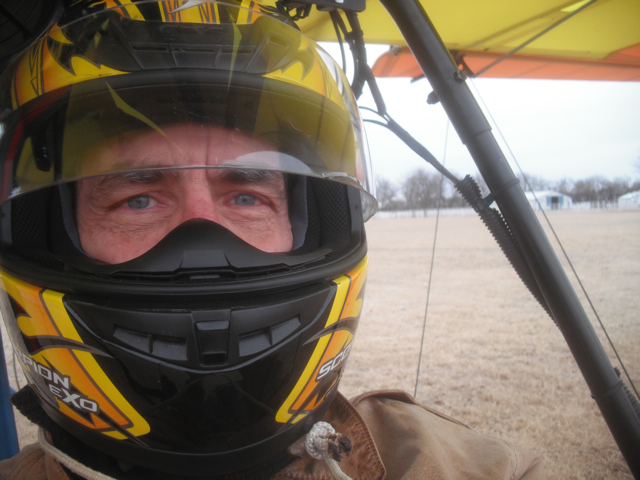 I really had not intended to fly that day but, knowing my self, I had brought my helmet and gloves just in case. Even though I didn’t have my full-body snow suit I figured I could come down after a few circuits of the field if it was too chilly. I hit the kill switch, gave it a good pre-flight check, put on my helmet and gloves, rolled the plane out of the hangar and re-started. 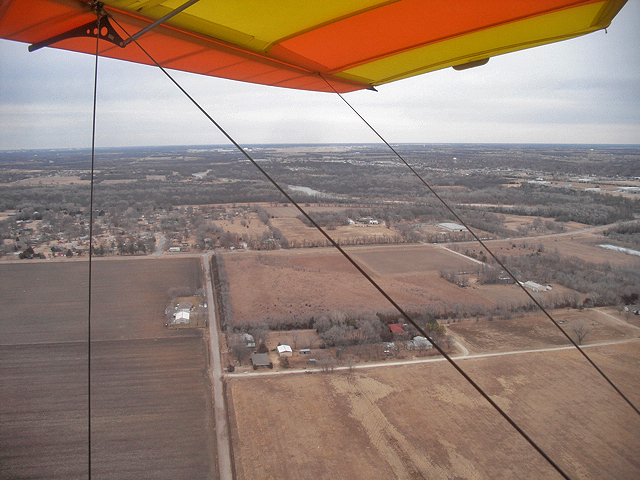 Flying in the winter over the plains of south central Kansas frankly does not have the visual appeal it does during the rest of the year. But of course, that is not limited to Kansas but everywhere the vegetation goes dormant or dies looks pretty bleak in the winter. To compound the bleak look of the prairie, the sky was completely overcast. The remnants of a recent snow are seen about. I shot the shot above right after takeoff. 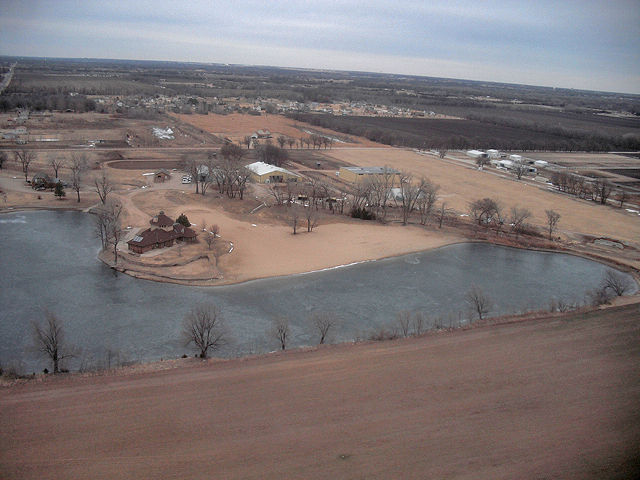 Wind aloft was about 25 mph coming straight at me so I climbed like a helicopter. 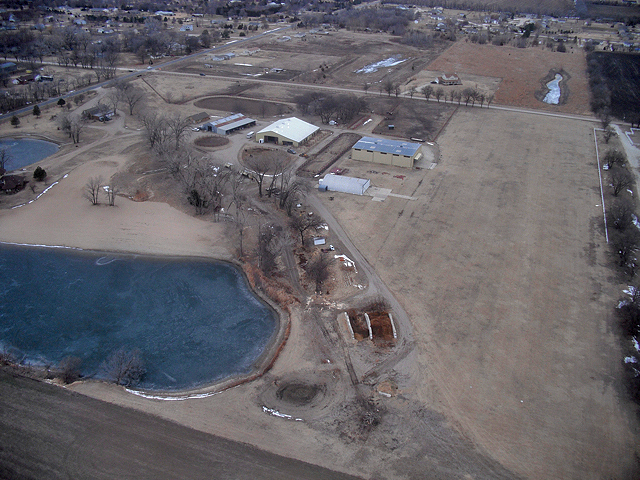 I noticed the lake around the Selby House was frozen so I took a non-standard right turn after takeoff to get the shot above. A month earlier this lake was covered with geese. I wish it was as obvious in this photo as it is to the natural eye but I will do my best to explain… I purposely put the wing and lift cables in this shot so I could show you what I call “looking down both barrels”. 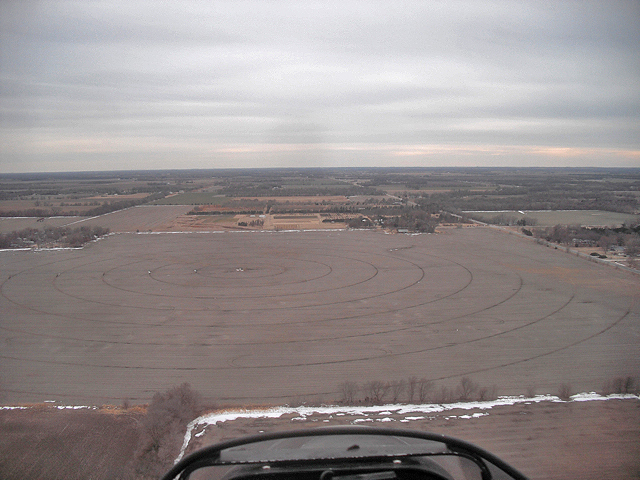 Our home field, Selby Aerodrome, is just south of the pattern for McConnell AFB which has two parallel runways. If you look closely between the two lift cables at the center of the shot just below the horizon you will see the two runways pointing right at the camera. Ergo “looking down both barrels”. 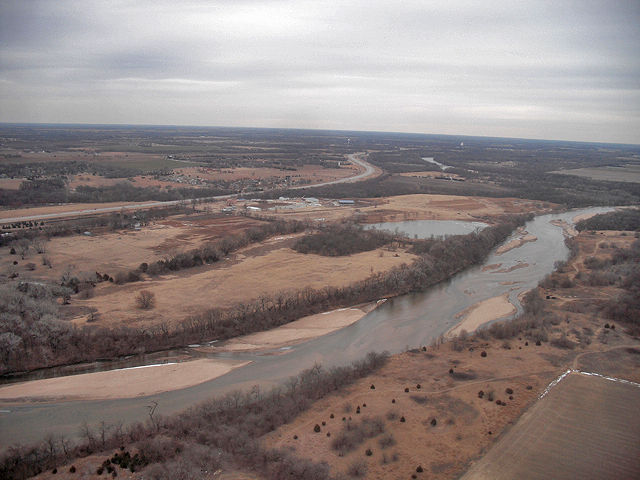 I decided since the wind was about 25 mph from the south (and it wasn’t prohibitively cold) that I would ease crosswind over to the Ark River and see what was happening over there. The picture above is from about 500′ AGL shooting the cam in the SSE direction. 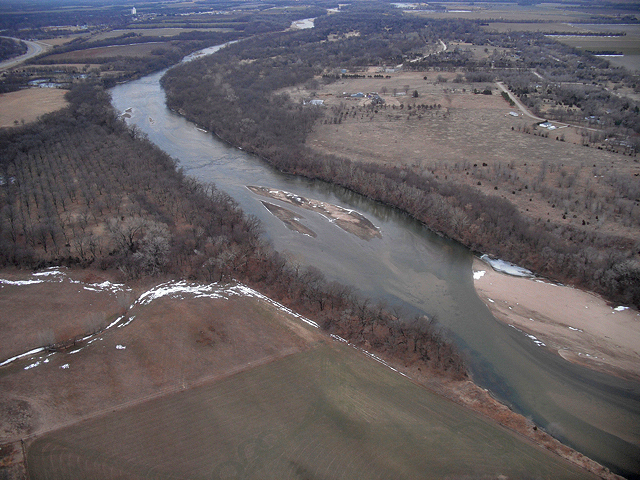 Although the river was nowhere near to becoming frozen you can see the remnants of a snowstorm about a week earlier. Once again utilizing my newly discovered “arm length reverse camera” technique, I tried about 6 times finally ending up with this shot. You can see the newly employed Ram mount holding my new Garmin Oregon GPS at a good position in my “cockpit”.I like to use the GPS because it gives me vertical speed and ground speed and allows me to figure winds aloft with a simple math equation geared to my limited ability. It’s nothing I need to have but it is fun to use. On trips of 60 miles or more it is useful to use the heading feature so I can better stay on course. I had a used Garmin eTrex that was pretty good but it finally just stopped working so I got this Oregon. I really like the new Garmin because the screen is bigger, it is in color and it has much larger numerals and more variety of data screens. After about 40 minutes in the upper atmosphere I noticed my right thumb had lost feeling. This is usually my best indication that it is time to land. I was downwind of the field and decided to see how fast I could get my groundspeed. With the tailwind I clocked 80 mph. 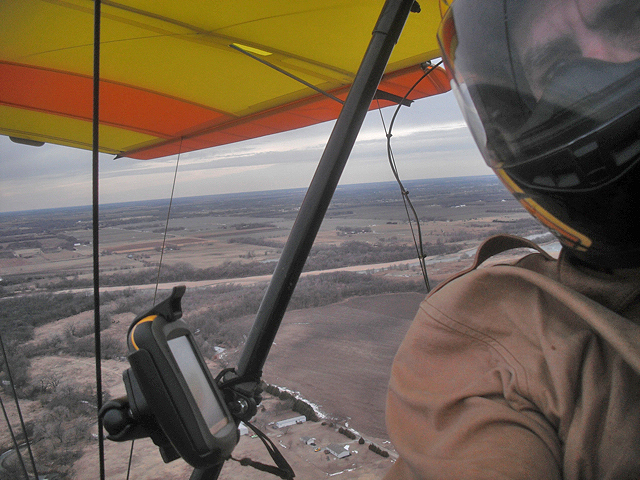 After the downwind pass I popped the Quicksilver into a right 180º and set up for landing. At about 3 feet off the ground I decided I needed one more time around the patch before putting the horse in the stable. I hear the temperature is going to be in the high 60’s this Saturday so I’m thinking about making a flight up to High Point. If I do, you will be the first to know (Well, second after I stop at Doug and Sabrina’s house).